Renko charts are a great way to analyze the market from a completely different perspective. If you like to cut to the chase and look at raw price action, then renko charts certainly are worth the time needed to learn them. The origin of renko charts is unclear but it’s thought they were first used by Japanese commodity traders in the last century. Their main strength is that they can simplify a price history and allow markets that are volatile like oil, metals, exotics and even some indices to be better understood. The unique way that renko charting works means that small, noisy, price movements can be hidden to uncover the things of importance like trends, supports and resistances. 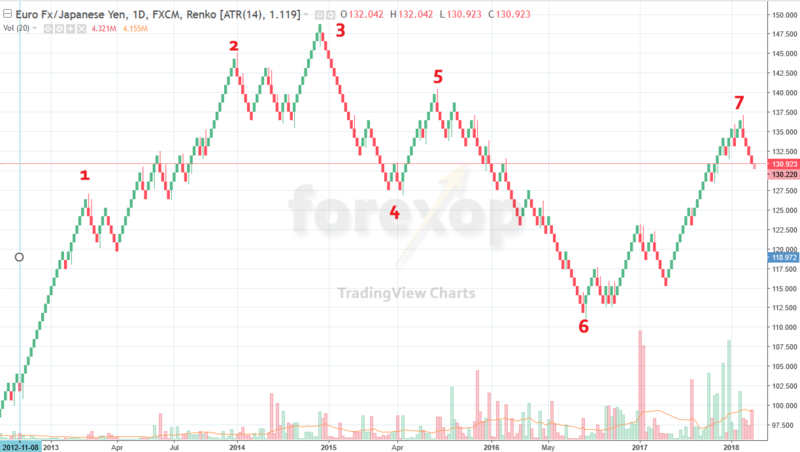 With the right understanding renko chart analyses can produce insights that have been overlooked by others using conventional price-time charts. Renko charts do not work in the same way as conventional price verses time charts. They do plot price on the vertical axis, but that’s where the similarity ends. Each point in a renko chart is a block or brick. And a brick is plotted whenever the price of the instrument increase or decreases by a certain amount. This means the chart only moves forward on the time axis when the price changes. In contrast to regular price-time charts, renko chart patterns are always made up of regular up and down diagonal lines. See Figure 1. Working with renko charts requires a different way of thinking. This is because with this method of charting the pattern changes only when the price moves up or down by a fixed amount. 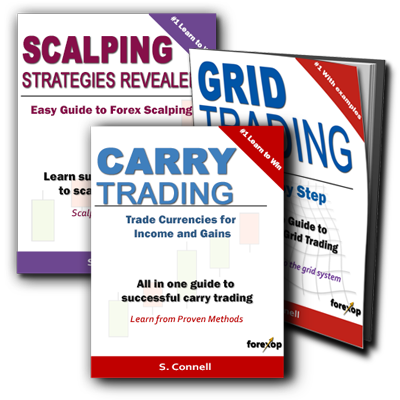 Renko charts never move horizontally, they only advance up or down at the same fixed rate. This makes understanding trends a little unclear at first. When the price of the underlying accelerates in a strong trend, a regular chart plots this as a steeper line on the vertical plot axis. This represents a faster rate of change of the price with respect to time. The renko chart meanwhile plots more points or blocks to represent an accelerating price. The stronger the trend, the more renko blocks will be plotted in the chart during that time period. This means that the time axis in the renko chart is not fixed but expands or contracts according to the strength of the trend. For example, if the renko block size is set to 100 points. Each block represents a fixed unit of price movement. 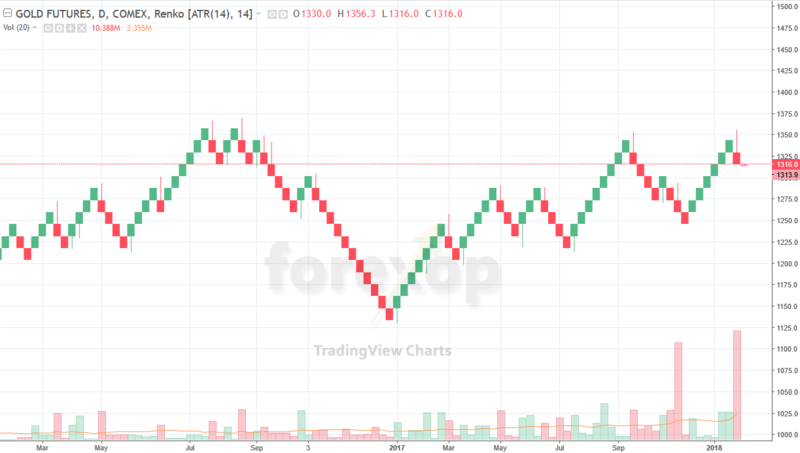 The renko chart will only add a new block and advance forward on the chart when the price moves up or down by exactly 100 points. Throughout periods when the market is flat, the renko chart is non-changing. 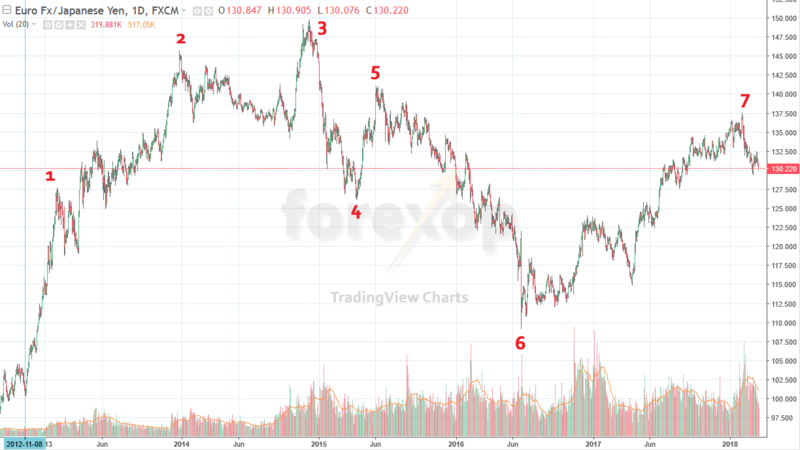 The charts in Figures 2a and 2b compare EURJPY over the same time period. The first chart is a regular price versus time chart. The second is a renko chart. The corresponding peaks and troughs on both are labelled for comparison as points 1 to 7. On both charts the distance between points 1, 2 and 3 is roughly proportionate. But from the time where the price falls abruptly after point 3, the renko chart does not respond in the same way. The time axis on the renko chart is variable, so this rapid price fall is represent by a faster rate of advancement or plotting of renko blocks. In essence then, the renko chart removes the time and rate of change components from the chart. It replaces this with price and rate of chart advancement by plotting bricks at a faster or slower rate. The purpose of that is to hide the minor, random price jitters that don’t play a part in the understanding of a trend. While this might sound confusing, when plotted, a renko chart can give insight into trends that would otherwise be overlooked when focusing on a price-time axis alone. When compared side by side, the renko chart usually has much less noise and can better identify the trends, the highs and lows without the clutter. One of the snags with the standard renko system is that of the fixed block size. In real markets, the magnitude of price changes is not fixed but is dynamic. This is known as market volatility. A 100-point brick size might be suitable at one time, but not at another time. In most markets volatility does change from day to day, week to week and year to year. To get around this, most renko charting systems use a volatility setting rather than a constant block size. Instead of having a fixed size for every increment or decrement, the size is set according to a volatility measure known as the ATR or Average True Range. In this way the block size represents a unit of volatility rather than a fixed unit of price. This sidesteps the need for having to set a rather arbitrary block size. Instead, the chart will adjust the size accordingly as the volatility changes over time. Renko charts are particularly good at finding support and resistance areas because they condense long, but static periods. Many traders find this makes it easier to see where price support and price resistance is occurring. Technical tools like moving averages, oscillators and support-resistance can all work on renko charts. Most financial charting packages have the capability to plot renko charts. 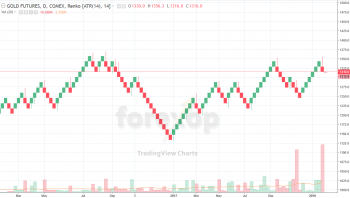 As well, there are many adaptations to the standard renko system and for these there are a wide range of custom renko indicators and trading systems. I avoided using renko charts because the use and idea behind it was outright pitched to me wrong. I was under the impression that it was more complex than this and that it was hardly useful for trends. I was using range bars instead but this sounds much easier.